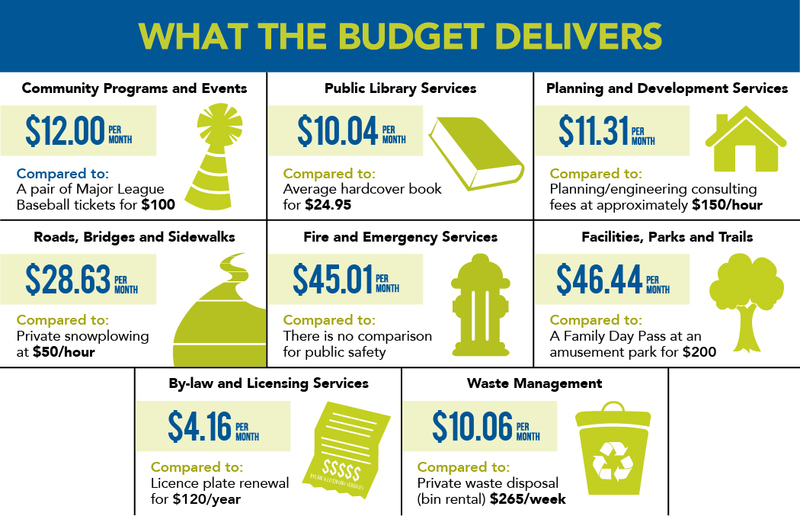 Council approved the 2019 Budget at the March 4 Council Meeting. Click here to learn more. The following is a list of questions and answers from our recent budget discussions. What is the total annual budget for the Town? The total budget for the Town is $159.2 million: $131.5 million dollars for the Operating Budget and $27.7 million for the Capital Budget. Learn more about Operating and Capital Budgets here. What will the tax impact of the budget be on the average residential property in Newmarket? Town of Newmarket Council approved a 2.2 per cent tax increase, combined with 0.75 per cent for asset replacement for a total 2.95 per cent tax increase (Town portion) for the 2019 Operating and Capital Budgets. Based on an average property assessment value of approximately $607,000, residents will see an increase of $58 on the Town portion of their tax bill, a water/wastewater rate increase of $58 (5.10 per cent) and a stormwater rate increase of $4 (11.8 per cent). What are the operating costs of the Mulock Farm property? The Operating Cost sees $200,000 allocated for the maintenance of the Mulock Estate - the heritage building and the 12-acre property. $150,000 will be put into reserves to use toward the property for future use. For a full list of Budget 101 terms and definitions, click here. If you require any of the reports or presentations in an alternate format, please contact (905) 895-5193. The theme of the 2019 budget is ensuring we meet the needs of our community now and in the future. How do approach building a budget for our community? We focus on continuing to deliver top-quality programs and services to our residents. We plan ahead to ensure we have the space, facilities and infrastructure we need for our future population. We get valuable input from residents and members of our community on how they want to see their tax dollars invested which can help guide our Council's Strategic Priorities. On an annual basis, the Town prepares a budget to authorize its expenditures for the year, which includes operating expenses and capital expenses. What are operating and capital expenses? Operating expenses are expenses required for the day-to day needs of the Town. Operating expenses help the Town to maintain its current levels of service in the community and cover things like snow plowing, waste and recycling pick-up and fire and emergency services. Capital expenses cover one-time projects which serve as an investment in our future, and benefit our overall community. The creation of Newmarket Riverwalk Commons, the restoration of our Old Town Hall and the recent purchase of the Mulock Estate are all examples of capital expenses. As set out by Council and informed by community input, the Town prioritizes projects and services to meet both legislative requirements and community needs when developing the budget. Although the budgets are broken-down into service areas, the budget is considered and recommended as a whole to enhance the Town's decision-making process. *Estimate based on the average assessed home in Newmarket. The following dates are subject to Council approval and may be subject to change. Stream a budget meeting online at newmarket.ca/meetings if you can't attend in-person.